2011 will be remembered as a watershed year in terms of road safety, notably marking the launch of the UN Decade of Action for Road Safety (2011-2020). It was also a very important and significant year for IRF with launch meetings of the Group of Experts on Road Safety taking place in New Delhi, Abu Dhabi and Geneva respectively. These were very well attended and were invaluable in terms of guiding the Group of Experts towards identifying the most significant road safety challenges, and mobilising high levels of capacity and competency within our organisation to address them through tangible initiatives that will save lives. If the very positive response and enthusiasm we continue to receive from the various follow up summaries and surveys is anything to go by, 2012 promises to be an exciting year indeed - during which we will endeavour to translate the important needs identified into dynamic actions that will enable our members to make a meaningful impact during the Decade of Action. This edition of the Road Safety Newsletter provides an update of recent activities in which IRF has played a prominent and active role and informs our members of upcoming activities and programmes which might be beneficial to organisations, government institutions, suppliers and NGOs. It reflects on IRF’s involvement with UNRSC, UNECA, UNECE and other key international bodies and reports on road safety initiatives in Africa, Australasia, India and the Middle East as well as on progress with the development of guidelines for road safety Master Plans, the Group of Experts on Road Safety, the InARoaD awards programme, upcoming events and many more. I would like to urge members to forward articles for future newsletters – it is a very good forum/platform to share and exchange experience and expertise. We would also appreciate feedback on the newsletter in order to ensure that we cater for the needs of our members. Enjoy reading our newsletter and we look forward to your continued support. Following successful and well attended launch meetings in New Delhi, Abu Dhabi and Geneva respectively, the IRF Group of Experts on Road Safety is in the process of developing the detailed structures and Terms and Reference that will guide the initiative going forward. 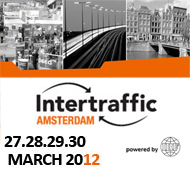 These will be finalised at the Group's next Plenary Meeting scheduled to take place at the end of March, in the fringes of the influential Intertraffic Amsterdam 2012 exhibition. “The African road network is being built to meet the requirements of mobility at a reasonably fast pace. While we go ahead to build this infrastructure, it is necessary to ensure that we build safer roads by adopting and incorporating the requisite road safety measures.” These words, from the keynote address by IRF Geneva Chairman, Kiran K. Kapila, set the tone for the 2nd African Road Safety Conference which took place in Addis Ababa, Ethiopia, from 9-11 November 2011. Robert Tama Lisinge, Highway and Transportation Engineer with the United Nations Economic Commission for Africa, and a member of the IRF Group of Experts on Road Safety, views the adoption of the African Road Safety Action Plan for 2011-2020 at the 2nd African Road Safety Conference (see previous article) as a clear signal of the intention of African countries to stay at the forefront of efforts to implement the UN Decade of Action for Road Safety. The gracious offer of the Municipality of Abu Dhabi to host the second launch meeting of the IRF Group of Experts on Road Safety gave delegates a unique opportunity to participate on the previous day in a major International Seminar organised by the Municipality on the theme 'Making Abu Dhabi's Roads Safer'. As an active member of IRF, The South African Road Federation (SARF) responded to the call for support for the Decade of Action by arranging a very successful road safety conference on 7-8 June 2011 in the City of Tshwane (Pretoria). Titled Road Safety Initiatives towards a Decade of Action, the Conference notably led to the development of a Declaration and Action Plan which was endorsed by various government departments, NGOs, institutions, organisations and suppliers. A 2nd SARF Conference will now be held in Tshwane from 7- 8 August 2012 to reflect on the actions that have been implemented and the success thereof. As highlighted by Etienne Krug, Chair of the 14th Meeting of the United Nations Road Safety Collaboration (UNRSC) recently convened in Geneva, 2011 has been an exceptional year of achievement in the road safety field. 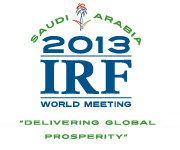 IRF Geneva continues to play a prominent and active role within UNRSC, notably Chairing the influential Working Group dedicated to infrastructure, mobility and access. UN Secretary-General, Ban Ki-moon, has released his latest report on road safety. Developed with support from WHO in consultation with the United Nations regional commissions and other partners of the UN Road Safety Collaboration (UNRSC), the report reviews implementation of the various UN General Assembly resolutions on road safety during the period October 2009 - August 2011 and concludes with a number of recommendations for consideration by the General Assembly to achieve the goals of the Decade. Click here to view the full report. IRF's India Chapter follows up the success of last year's landmark 6th Regional Conference on Road Safety and Intertraffic Exhibition – the proceedings of which can now be consulted online - with a dynamic programme for 2012, including a number of key dates for your diary. One of IRF's new flagship products is the tablet application developed by the organisation's Indian Chapter to facilitate the on-site collection of precise and scientific accident data by traffic police. The application is currently available for any tablet using an Android operating system. IRF in association with the ARRB Group has developed a five-day certification course for road safety auditors. The main objective is to build road safety engineering and crash investigation capacity by creating trained professionals to undertake road safety auditing and investigations, and to certify them for international level recognition. Shaping the future: linking research, policy and outcomes is the theme for the 25th ARRB Conference, to be held from 23-26 September 2012 in Perth, Western Australia. Globally, road safety is not only a transport problem but also a serious economic, public health, social development and social equity issue. IRF is rising to the challenge of producing a comprehensive set of model Guidelines for the Development of Road Safety Master Plans. These are aimed at assisting and advising municipal authorities as they endeavour to make their communities safer. Following the celebrations of the 60th anniversary of the Working Party on Road Traffic Safety (WP.1) in 2010, UNECE last year stepped into its seventh decade of action in the field of road safety, which coincided with the onset of the UN Decade of Action (2011-2020). The prestigious Senior Road Executives (SRE) Programme, organised by the University of Birmingham (UK) in association with IRF, features a dedicated Road Safety Module, which will run from 25-27 June 2012. The module brings together leading world experts from academia and industry to discuss the most up to date concepts, principles and practices for institutional reform in the road sector. The programme is particularly tailored to the needs of senior practitioners from emerging economies and developing countries, members of road boards, government officials and key staff from multilateral donor agencies. EuroRAP has published the European Road Safety Atlas, a valuable resource for politicians, road authorities, enforcement agencies and IRF members to help target action over the Decade of Action. AusRAP has just launched the latest performance tracking report that will benchmark the performance of Australia's roads in the Decade of Action. More than 20,000km of road have been assessed, comparing performance from the 2000-2004 period with the latest available data from 2005-2009. A workshop on Global Road Safety and advancing the Decade of Action was convened during the TRB Conference in Washington. As part of the new TRB Global Road Safety Subcommittee, research priorities will be coordinated at a global level through five workgroups based on the five pillars of the Decade of Action. This will be the theme of the next Conference of the Australasian College of Road Safety (ACRS), to be held at The Menzies, Sydney, on 9-10 August 2012. The inaugural ACRS National Conference was held in 1995 and the event continues to attract the highest level of experts from both international and national Road Safety spheres. IRF Geneva is proud to announce the second edition of its prestigious InARoaD Awards programme, which includes a prominent road safety category. The closing date for submissions is 5th March 2012. Join the IRF today and get the first month of your membership* absolutely free! Take advantage of a whole range of things including a free copy of the IRF World Road Statistics (2011), the upcoming Environment & Climate Change Bulletin, and preferential registration rates for upcoming IRF events! Join us, and become a part of the IRF community.